Blog - Spinfy - quality content for kids with smart parents! Does Spring Make Us Better App Developers? Do you know the feeling when you are not quite sure what is about to happen but you know it’ll most likely change the course of your life? This feeling might come when you graduate from high school, when you find your first job or when you move to another city. Basically, it’s always there when big changes happen. The feeling is exciting, overwhelming, and sometimes even scary. Every year the first really sunny days lighten us up in Finland. The steps seem to be lighter, smile is wider and everything feels simply brighter. See, I’m even writing with rhymes! It’s amazing how people in the North quickly turn into happy human beings as soon as there’s enough light. Lately, we have been devoting time to study the free-to-play model that is used in the mobile gaming industry. When checking the App Store and Google Play grossing rankings it is easy to see which apps are making the best monetization. At the moment, they are all free-to-play apps. Last week I told you about the first steps in our app development process at Spinfy. Now I'll go through the rest. 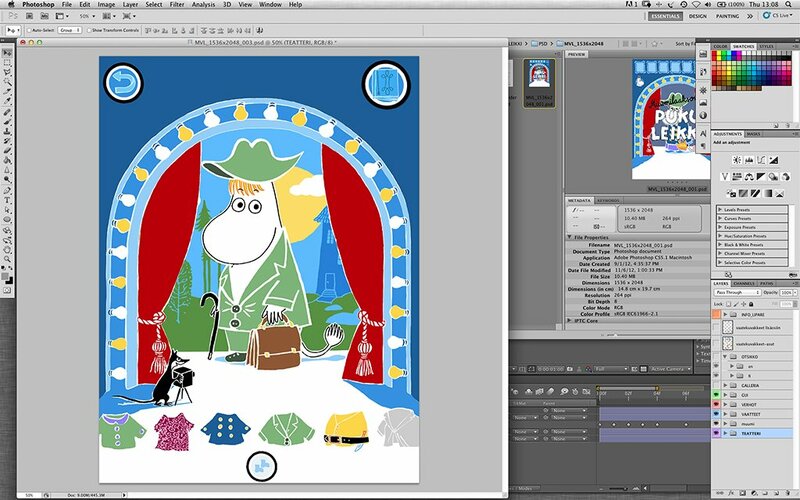 This time I'll share with you some details of how we developed the interactive Moomin Costume Party kids app. Using a known brand like the Moomins means instant recognition from the existing fan base, but there's also more parties involved and a more complex decision-making process. I hope this post will give you some new insight on what happens in our office on a day-to-day basis. Too Embarrassed to Read Book Apps? Are you ready to rock with your iPad? You should be because a green heavy metal wave has hit the App Store! Heavysaurus has conquered a new frontier. Our new bright green friends, wearing black leather clothes, are now available as an interactive storybook for the first time. Why to Make Book Apps? People have talked about the digital reading revolution for a long time. If you didn’t notice, it’s definitely here. More and more books are published and read as e-books and book apps. The simple reason for this? There’s a generation of readers that expects everything to be interactive. Check this video for proof. Hi, I'm Maja, a new trainee at Spinfy. I have two children that are thrilled about my new internship because they can test the latest interactive storybooks before they hit the App Store. Yesterday I borrowed one of the iPads and went home to spend some quality time with my family. We were all listening to The Book About Moomin, Mymble and Little My, and my three-year-old and her daddy got to look for hidden interactions. They both laughed and giggled and I had to patiently wait for my turn – that never came.